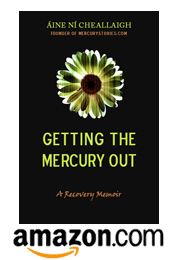 Recently, I had the pleasure of reading a new memoir written by a fellow mercury sufferer. Having written a similar book myself, I was very excited to read Nancy Seagal’s Rising Above Mercury to see what her journey was like. Just like me, Nancy was the second-to-last child in a large Catholic family. Right on the first page, I could tell we were going to have a lot in common! Her moving description of her early years echoed my own dysfunctional upbringing, and made me think about similar stories I’d heard from other mercury sufferers. These stories make me wonder how many of our parents were struggling with heavy metal toxicity that never got diagnosed–it makes sense on a lot of levels. Much of Nancy’s story details her struggle to find a diagnosis for her fatigue, pain, tremors, muscle spasms and paralysis. The paralysis was her most alarming symptom, as it would come upon her without warning, leaving her unable to move for unpredictable periods of time. The thing that struck me most about Nancy’s search for a diagnosis was how poorly she was treated by the doctors she saw. Because none of her symptoms caused irregularities that could be detected using a spinal tap or MRI, doctors dismissed her, refused her pain medication she clearly needed, and accused her of faking her condition. This truly boggles my mind. It never happened to me–thankfully, I avoided going down the conventional medical road when my mercury symptoms began. But I hear it all the time from mercury sufferers–doctors refusing to help because the patient’s symptoms do not fit certain predefined criteria. It’s not just the fact that doctors refuse to help that blows my mind, nasty enough as it is to deny care to a person who is suffering deeply. It’s the way that they try to turn things around and blame the patient for being so difficult. Or even worse–they flat-out deny the patient’s reality and tell them that they are not experiencing something that is all too real. Luckily, Nancy was able to figure out that mercury was her problem and stop her exposure to mercury and begin her recovery. I was a bit apprehensive to read that she used DMSA on an infrequent dosing schedule–I am a Frequent Doser all the way and wouldn’t recommend any other kind of chelation. But Nancy seemed to make it through detox okay, even if it was a bit rough on her. Putting her treatment choices to one side, I really recommend Nancy’s book as a great read. The world needs more people writing about what mercury toxicity is really like. We need to have our experiences mirrored, and we need books that will educate the public about what mercury sufferers go through. Nancy’s book does all this and more. Hi, I live in the UK and have just self-published my own book on Kindle called “My Journey Back to Health – How I survived mercury poisoning naturally without harmful drugs” by Alice Hill. I have read Aine’s story on my Kindle and the methods she used to rid her body of mercury which I found interesting. The methods my doctors used were different (in their literature they did not recommend DMSA/DMPS as chelators to remove metal). I seemed to suffer less of the ‘rollercoaster effect’ that Aine experienced after she had her amalgam fillings removed. I agree with the comments made above the main difficulty for me was getting a correct diagnosis about what was causing my symptoms. It took 30 years of differing opinions and diagnosis from various medical professionals before getting the underlying cause identified as mercury poisoning by holistic doctors who were honest enough about identifying what was causing my symptoms. I would really appreciate any customer reviews of my new book as I would be interested to know if anyone in the USA have been treated in the same way to myself and with similar outcomes. You can also leave your feedback on my email address alice@hilljourneybacktohealth.com.